Did you know that Israel is not the only Jewish state in the world? Deep in the territory of the Russian Federation, close to the Chinese border is the other Jewish state: Birobidzhan. Founded in the 1930s as the new home for all the Jews of the Soviet Union, built up on the wonderful vision of Jewish autonomy, the project came about in an unexpected way. 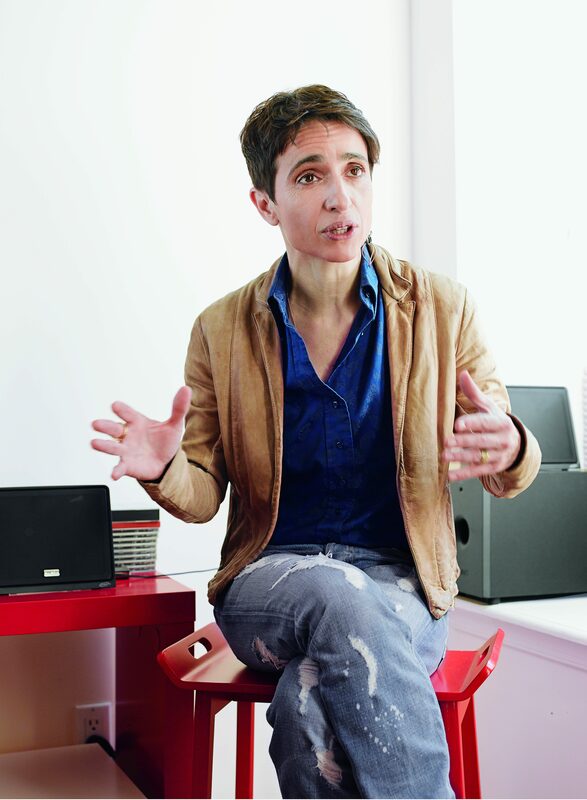 In 2009, almost 80 years after the establishment of the Jewish autonomous region, Russian activist and author Masha Gessen visited Birobidzhan and researched the history of the place. 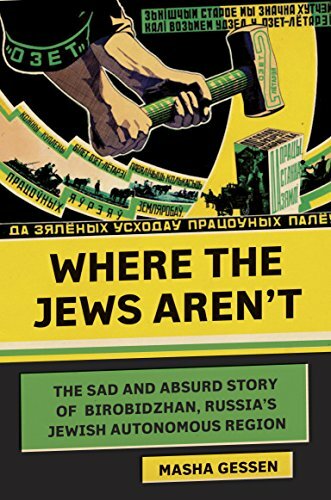 She tells the story of the people and region of Birobidzhan in her latest book, Where the Jews Aren’t: The Sad and Absurd Story of Birobidzhan, Russia’s Jewish Autonomous Region. Gessen is known for a critical perception of her home country Russia and its leader Vladimir Putin. Her book, The Man Without a Face: The Unlikely Rise of Vladimir Putin, was translated into 20 languages and was described as “courageous” by The Telegraph. Gessen left Russia in 2013 to live in the United States, after another law discriminating against the LGBT community was passed. Moment’s Jewish-German dialogue fellow Thomas Siurkus spoke to Gessen about her newest book, what it means to be a Jewish writer and how she feels about Russia. Did you feel any personal connection to Birobidzhan when you decided to write a book about the region? I wouldn’t say that I felt any personal connection to Birobidzhan, because Birobidzhan is much more an idea than a place. The actual place exists, but I was interested in something that never happened there: the creation of a Jewish autonomy. I was interested in writing about the ways in which it was meant to be fulfilled. I knew that the place was an absurdity when I started to research it. That much I knew. Could you elaborate on how the idea of a Jewish autonomous region was created? As Jews gained more rights in a number of European countries, for the first time in the Diaspora there was a real threat that Jews would give up or lose their culture, language, religion. One response to that was Zionism. In his pamphlet, “The Jewish State,” Herzl laid down the reasons for the need to create a Jewish state. He was stating that antisemitism would always follow Jews everywhere, as long as they live in Diaspora. Therefore they should create a Jewish nation state with their own military and sovereignty. A sophisticated response to Herzl’s thesis was Jewish activist Simon Dubnow’s of Jewish autonomy. He thought that Jews shouldn’t strive to have their own sovereignty and their own military. They should live in the Diaspora, as they have done for the last 2,000 years. They should enjoy the protection of the military of the country and speak the native language. In addition to that they should preserve their culture, identity and way of life. The way to achieve that, in his opinion, was by securing cultural autonomy that can come from self-formed government. Instead of founding a single Jewish state, Jews should seek autonomy where they lived. His argumentation was based on a model of the evolution of nations. The lowest stage in this system was the tribe, followed by the nation. The highest stage of the evolution would be a post-state nation, a cultural nation that cannot threaten other people with its military that does not have territory to fight over, but is tied together by its culture and by its customs. Dubnow believed that the Jews had already achieved the highest stage by living in diaspora. Founding a Jewish state would have been a step back in the evolution. This was the wonderful idea about autonomy, but the realization had nothing to do with it. How was the idea of a Jewish autonomous region carried out by the Soviets? It all began with the Russian Revolution in 1917, which dismantled the Tsarist autocracy and replaced it with a Communist regime. The Bolsheviks imagined establishing the Soviet Union as a sort of anti-imperial empire—where every ethnic group would have its autonomy. Jews were an ethnic group, but didn’t have a territory in the Soviet Union. Therefore the Soviets wanted to create a territory where Jews could establish an autonomous region, to set them equal with all the other ethnic groups. The original idea was to settle them in the Crimea, but they faced huge resistance from the local people. Therefore they decided to send the Jews far away where they wouldn’t face that kind of resistance. They sent them to an area that was close to the border to Manchuria, and that’s how Birobidzhan came to be. You say that Birobidzhan was “the worst good idea ever.” Why was the idea of a Jewish autonomous region doomed to fail? I don’t know if it was doomed to fail in general. In fact I think the idea of autonomism is a wonderful vision that I hope to see happen in a distant future. But all good ideas that were carried out by the Soviet state became bad, because they used ideas to terrorize people, which sometimes also included purges that happened in Birobidzhan and involved not a small amount of anti-Semitism. The framework on which the Soviets wanted to build a Jewish autonomous region was doomed to fail. One of the protagonists of your book is David Bergelson. Why did you choose to focus on him? Any story is usually better told through people. Bergelson was a major figure in the Yiddish literature scene and remains a very important figure in this scene. But of course most people nowadays have never heard of him. Nevertheless he was a fascinating figure to me and that’s why I chose him. I was looking for a figure that was interesting, that left a trail, which wasn’t normal in the Soviet Union and that was somehow involved in Birobidzhan for a long time. He also provided me with the main theme of the book: the rumination on the nature of exile and belonging. Historically it was important for Jews to know when to run. It has been a key to survival and Bergelson was very good in knowing when to run. He lived to the age of 68, which was quite an accomplishment for a Jewish writer in the Soviet Union. He left Russia after the revolution and moved in 1921 to Berlin, like a lot of Jewish exiles. Around the time the Nazis came to power, Bergelson realized that he had to leave Berlin. He returned to the Soviet Union and became a citizen of Birobidzhan. He wrote extensively about the Jewish autonomous region in Yiddish language press abroad and agitated people to come to Birobidzhan. He is certainly responsible for the move of thousands of American and Latin American families to Birobidzhan. David Bergelson praised Birobidzhan in his writings. How have you experienced your visit to Birobidzhan? What was the most absurd and sad encounter? Probably the saddest encounter was the one with the last surviving voluntary settler in Birobidzhan. He had always dreamed of going to Birobidzhan and to realize the vision of Jewish autonomy. When he settled there in the late 1940s, he not only encountered horrible living conditions, but also anti-Semitism. He lived in a state of heartbrokenness when I met him in 2009. Back then he was very angry—at a God he stopped believing in after the Holocaust, in which all but one member of his family died; angry at the Soviet Union, which lured him to Birobidzhan, what turned out to be a lie. The most absurd encounter was probably my search for Jewish food in Birobidzhan. First I was told that I would find Jewish food at a Chinese restaurant, but there they told me that they had discontinued the Jewish menu, because there was no demand. I then went to another place that offered Birobidzhan Schnitzel, which turned out to be pork. At the third restaurant they finally said, “Yes, we have Jewish food.” They offered me gefilte fish—heated up. What remains today of the Jewish roots of Birobidzhan? We have to bear in mind that Birobidzhan never actually was a Jewish state. It was a place where Jews came out of desperation and out of hope to build a Jewish state. What remains today is a memory of an illusion. Some buildings still remind me of the Jewish past of the town; the huge statues make the region look like a shtetl theme park and it’s still officially called the Jewish Autonomous Oblast in Russia. Birobidzhan also continues to get funding for the promotion of what is supposed to be its native culture. Therefore they still have a Jewish dance ensemble for children, although most of the children aren’t Jewish. Many Chinese people immigrated in the last 20 years, so today their children are dancing in the Jewish dance ensemble. Do you see any parallels between yourself and David Bergelson? I think Bergelson is an example of what Jewish writers were traditionally, which is that Jewish writers are multilingual. A lot of Jewish authors wrote in different languages at different points in their lives, because they moved geographically and socially. Dubnois wrote in Yiddish, Russian and Hebrew. He translated his pieces himself and rewrote them in other languages, which is very different from being translated into another language. Bergelson wrote in Yiddish, but for him looking for the right language was very much the point of becoming a writer and sort of finding out for whom he was writing and in which language. Most writers in other countries don’t actually face this issue. I try to explore that theme by writing about Bergelson and writing about Dubnois a little bit, because it’s something that is very important to me and I used to think that I was unusual in this, but I’m not. It’s actually a typical predicament for Jewish writers, and now of course in the early 21st century it’s becoming a normal issue for all sorts of writers, not necessarily Jewish writers. You said earlier that Bergelson always knew when it was time to leave. You also had to leave your country a few years ago. Do you see a parallel between you and him? When I think about all the Jews that had to leave their country in the 20th century, I think it would be a bit silly for me to say that I see a parallel between him and me. I used Bergelson as a great example of the Jewish predicament of thinking and with him I tried to approach an issue that is very important in Jewish culture: when do you stay and when do you leave. When is staying irresponsible and a betrayal of Jewish precepts, which value life above everything? This concept is very contrary to the Russian tradition where there is a kind of mythology of value attached to staying in your country, even if it means that you die. Jews have nothing good to say about that. Their primary responsibility is to survive. So do you think that there is a dilemma in being Jewish and Russian? Russia is a culture that often doesn’t give you the opportunity to choose—you’re always the Jew. I think that is the difference between how Jews might experience their Jewishness in other countries. In the United States I think people think that being Jewish is a matter of choosing whether you practice Judaism or not. What did it meant for you to be Jewish in Russia and to know that your country doesn’t want you simply due to the fact that you are Jewish and gay? It is not a pleasant experience, but I think it is a great gift. And great gifts sometimes come with an enormous amount of pain. Do you think that Birobidzhan is a metaphor for Jews in Russia in general? They live in a country that doesn’t want them and they always have to resettle. Do you think that there is a future for Jews in Russia? No. I’m extremely pessimistic about Russia’s future. Period. I’m sad for everyone who lives there. It is a country that is anti-human at this point. It happens to be particularly anti-gay right now, and it’s also against ethnic groups. I wouldn’t place Jews anywhere near the top of the xenophobic hierarchy right now. Other ethnic groups have it much worse, but that could change at any moment. The saddest thing for me right now is that the country is terrible for its people and to its people.